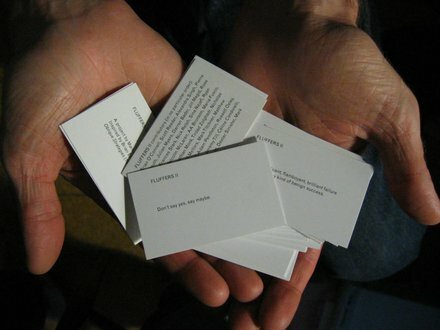 FLUFFERS II is a deck of 100 cards each printed with an aphorism. Invented by Brian Eno and Peter Schmidt in 1975 under the original title of Oblique Strategies, they are intended as an aid to solving creative problems: each suggesting an approach which might run counter to normal intuition. Contributors (in no particular order): Brian O’Connell, Scott Reeder, Alexandre Singh, Pierre Bismuth, Julian Myers, Darren Bader, Jill Magid, Rose Kallal, Frances Stark, Nick Relph, Sina Najafi, Ryan Gander, Malcolm McLaren, AA Bronson, Maria Fusco, K8 Hardy, Jonathan Monk, Tirdad Zolghadr, Nicholas Bullen, Nathaniel Mellors, Mark Titchner, Matthew Higgs, John Russell, Adam Pendleton, Russell Oxley, Dan Fox, Mel Jackson, Jeremy Till, Celine Condorelli, Alex Waterman, Dan Kidner, Dexter Sinister, Mark Beasley, Stephen Beasley.